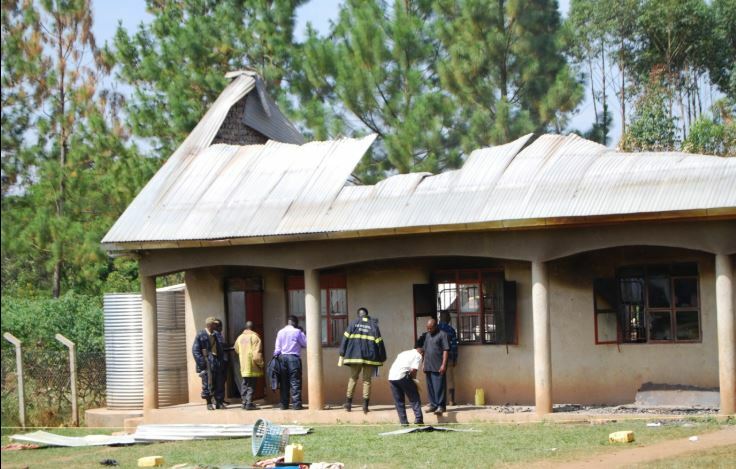 MUBENDE – Students of St James Katente Secondary School in Kiyuni sub-county, Mubende district, are counting losses after a fire gutted their dormitory, destroying property worth millions of shillings. The District Police Commander, Mr Martin Okoyo, said the fire broke out in the boys’ dormitory on Wednesday morning at around 5 am as students had gone for morning preps. No casualties were recorded. The fire whose origin is yet to be established burnt off the whole roof, destroying mattresses, clothes, books, and beds. Police is currently treating the matter as an act of arson. ‘‘It is very unfortunate for the school, the community and the whole country. We condemn it in all possible ways. So whatever happened behind there is very unfortunate. Whoever executed that arson conducted a criminal activity and as security, we are going to investigate that act to its totality,’’ Mr Okoyo said. “We are also aware of some conflicts that had been generated among the students some on suspension with others on expulsion and we believe the action could be connected to that,’’ he added. While addressing students at the school, Mr Okoyo retaliated that police is going to intensify its investigations to ensure that all culprits are prosecuted. He urged students to help provide police with information which can be used in investigating the matter. One of the students who had remained in the dormitory as he prepared to get out for preps told this reporter that he saw fire flames gutting one of the beds in one of the corners of the dormitory. ‘‘The fire started at around 5am as we were inside. We saw fire on the other side and called for help. The fire was started by someone but I did not see that person. We lost our property much as we tried to save some with the help of teachers and other students” he said. On hearing the news of the incident, parents rushed to the school. One of the parents, Mr. James Semahiro, said he wanted to know whether his son was alive. ‘‘We want a clear explanation from the school because we don’t know what is really happening. We don’t know whether the school will first give us our children as the administration sorts out the issues. We had paid all the dues and I don’t know how I will be helped after this loss,’’ Semahiro said. The school head teacher Mr. Bruno Kitunzi declined to comment on the incident.